I can't believe it took me THIS long to discover this movie. (Thanks, Alex!) It's not your typical boy meets girl sappy romance flick. (I saw 4 Christmases a few weeks ago...oy!) 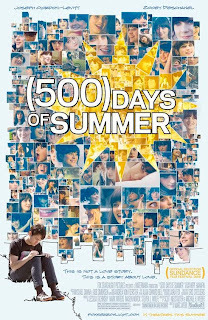 It describes the 500 days of a relationship. From its beginning to its end. As the movie poster and one of the opening lines state, "This is not a love story." It's true to life. (and freakishly similar to my life, to be perfectly honest...if I were a guy) There isn't a happy ending. Love doesn't always prevail. But that's ok. The dialogue in this movie is really genius. And although I love, love (Valentine's Day is my favorite holiday), it's refreshing to see a not so happy but kind of happy ending. Am I one of the select few that's seen this sarcastic masterpiece?